Odalys Gallery is my favorite gallery in Madrid. The space is amazing, but the exhibitions are even more so. Here I had the opportunity to see great masters from different countries. 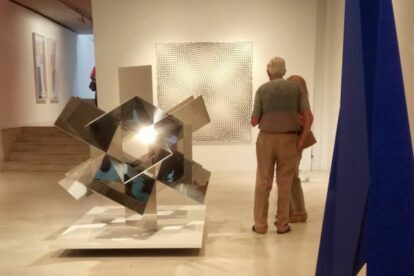 They specialize in abstraction, so in this place you can see large-format pieces by artists such as Carlos Cruz Díez, Jesus Soto, Mid Group, Antoni Tapies, Francisco Sobrino and many more. Personally I love contemporary art and here they usually have an interesting program during the year. Every month they have new exhibitions, the attendance is spectacular and in case you have an interest in collecting, this is the right place to venture into this world. They usually do art auctions online and sometimes live, so you do not have to go to New York or Christie’s to be close to top-level art.The three great rooms will always surprise you — these walls have been occupied from Warhol to Picasso to the controversial Liu Bolín. Another point in favor of this location is that you have two subway stations nearby, as well as good places to eat and have a drink. In general, the pieces they exhibit are interactive like those by Nicolás Schöffer. Here you will also find the best of contemporary Latin American art or even projects where they integrate art with architecture in the heart of Madrid. If you’re an art freak, this is a place you cannot miss.